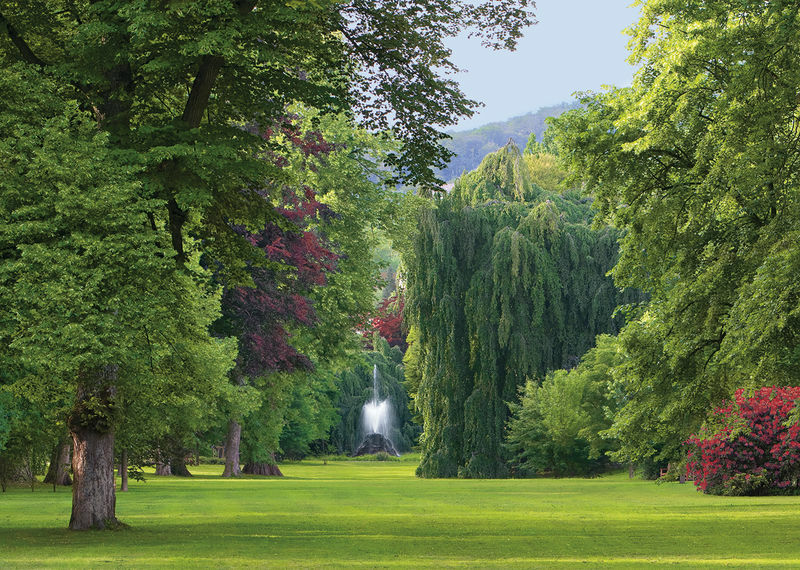 For more than 350 years the splendid park and gardens of "Lichtentaler Allee" have been the classic image of this small town on the Oos river, where they were created in 1655, as an avenue of oaks in front of the historic theatre. It was only at the start of the 19th Century that it was extended to become an impressive 3.5 km avenue from the Badischer Hof hotel to the Cistercian nunnery. Today the area is world famous, it has been immortalised by writers, and it boasts an impressive display of flowers and trees. It includes idyllic country scenes and elegant boulevards, and it is an ever-changing monument to the art of gardening. It has a rich growth of flowering rhododendrons and azaleas, and a splendid avenue of lime trees that stretches from the nunnery to the shepherd's cottage, with oaks, tulip trees, chestnut trees, plane-trees and alders. A stroll through the Lichtentaler Allee is a great way to enjoy nature at any time of year. In spring crocuses, daffodils and wild tulips spread from the foot of the trees like a colourful carpet, then when summer begins, red and purple rhododendrons start to bloom, so Baden-Baden's "green parlour" can be seen in all its splendour. Perhaps you might be more struck by the autumn colours, as the leaves turn a myriad of shades from yellow to dark red. Winter is tranquil and mysterious, with hoar frost on the meadows at the nunnery, as the roses lie dormant under the branches of fir trees. The "Lichtentaler Allee" is also extravagantly decorated with beautiful monuments from the Belle Epoque. There is plenty of art and culture to enjoy, including the Corinthian pillars of the historical pump room, the world famous snow-white Kurhaus/Casino, the neo-Baroque theatre built in the style of the Paris Opera, the Festspielhaus, Europe's second largest concert hall and opera house and Lichtenthal Abbey, a Cistercian nunnery that goes back over 760 years. With the opening of the museum, housing the Frieder Burda Collection, in October 2004, Richard Meier, the famous New York architect, has added a new jewel to the Lichtentaler Allee crown. Yet another highlight in its long and unique history. The Lichtentaler Allee also plays host to many first-class open air events all year round, such as the Philharmonic Park Night. Whether you jog, walk, cycle or simply stroll along the Lichtentaler Allee, it will prove to be a great sensory treat for body and soul. Let yourself be enchanted by the magnificent mature trees, the ornate bridges over the gurgling River Oos, the majestic hotels and the elegant mansions. The charm of this world famous avenue has had a far amount of time for it to blossom to the full – already over 350 years!